China has unveiled a prototype or scale model of the Anjian (Dark Sword) jet-powered unmanned combat aerial vehicle (UCAV). The image showcased the Dark Sword parked behind a team from the program, presumably engineers. 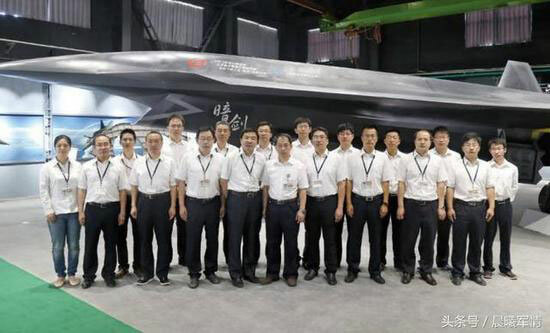 The Dark Sword seems to be of similar size to the Chengdu J-20, and Chinese observers estimate the UCAV to possess similar specifications as the fifth-generation fighter, with a takeoff weight of around 15 tonnes, a payload of one tonne and an operational radius of approximately 1,000 km. If designed for air-to-air combat, the UCAV may outperform Western manned fighters, with turn rates beyond 9 g.
Having successfully introduced the J-20 and its stealth technology to service, China is quickly transferring these applications to unmanned platforms. China is often alleged to be reverse-engineering Western design and technology, but the country is now revealing more UCAV variants than the West. It has already developed a range of jet-powered unmanned systems, such as the Guizhou Soar Eagle and Chengdu Cloud Shadow. These are reconnaissance platforms, but more recently China has been developing the Chengdu Sharp Sword UCAV and has revealed the Star Shadow concept by Star UAV.